Hamilton’s embattled transit division is facing another multi-million dollar shortfall this year, but despite successful advertising agencies, including Pattison and Corus Entertainment, seeking to offer the City more money for bus advertising, Council approved putting off competitive bids and failed to hold HSR managers to a 2015 deadline for the bids. The HSR’s current advertising agent, StreetSeen Media, was awarded exclusivity in 2004 when they won a five year contract. Since 2009, the initial five-year contract has been repeatedly extended, and having failed to meet the latest deadline to put the contract out for bids, HSR managers have extended the contract for the past 17 months (and counting) without a Council vote. Since 2009, HSR managers have preferred to stick with the current advertising agent saying they enjoy a “good relationship” with company. The City gives StreetSeen exclusive control of advertising spaces on HSR buses, and since there is plenty of “unsold advertising space”, the City gets a lot of “free of charge” advertising on buses. 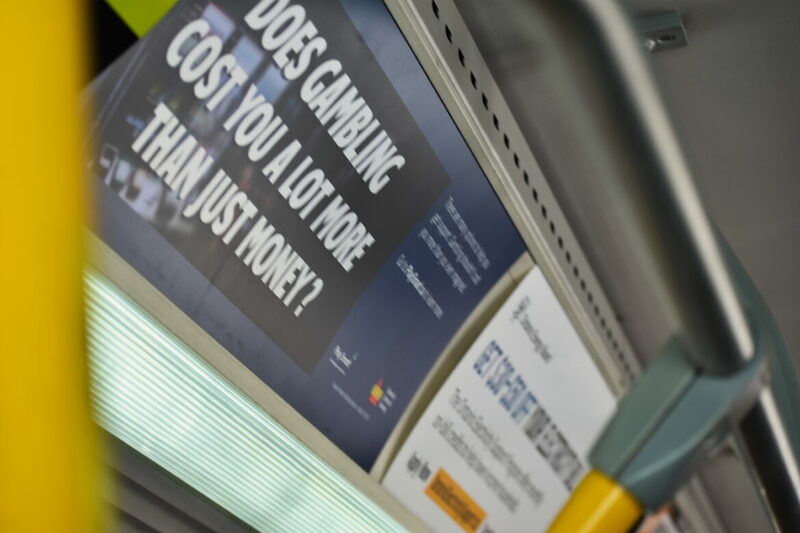 Most advertising on HSR vehicles is for City programs, with other ads generally public service advertisements about gambling, addictions, and health ailments. Debt companies, personal injury lawyers, and Money Mart are the other major advertisers on the HSR. Outside wraps prove more popular with restaurants, malls, and higher-end jewelery stores among the purchasers of bus wraps. The problem is that the adverts on the HSR are not just generic public service messages, but are mostly aimed at social problems like alcoholism, child abuse, drug abuse (needle exchange programs), homelessness, emergency birth control, violence (“zero tolerance for violence”) and subsidy programs for the poor. And there are always many adverts aimed at raising money or awareness for diseases (often using deliberately shocking language to get attention “cystic fibrosis is like drowning on the inside”). Although these are worthy issues and programs, the net effect on bus riders is to make their ride depressing. Why are bus riders forced to look at this smorgasbord of misery each time they ride the bus? It broadcasts the message that society considers that bus riders are a group of poor, homeless, violent drug abusers. And any casual rider is likely to be shocked by this very unusual range of advertising and wonder what sort of company they’ve got themselves into. The contrast is driven home by the fact that the adverts on the OUTSIDE of the bus or, at bus shelters, are uniformly upbeat commercial ads for “normal” goods and services. In other words, society doesn’t feel that motorists need to be informed of the important social problems and diseases that fill the inside of the bus. The irony is that one of the largest groups of HSR users are high school, university and college students … who are the prime target of advertisers. Why isn’t the HSR highlighting the fact that many of their riders should in fact be a highly desirable audience? Part of making transit attractive is making the ride pleasant … filling the inside of the bus with depressing ads, full of graphic images and shocking messages, is not the way to succeed. Most other successful municipal transit systems do not do this, and neither does GO Transit. 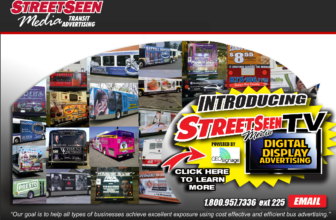 The contract with StreetSeen media began in 2004 following a competitive bid process. The contract was for five years. In 2009, HSR managers asked Council to not put the contract to competitive bids after receiving an “unsolicited” offer from StreetSeen Media to extend the contract for an additional five years. This offer came with a minimum payment of $425,000 per year, up from $350,000 under the first contract. Council approved the five year non-competitive extension. 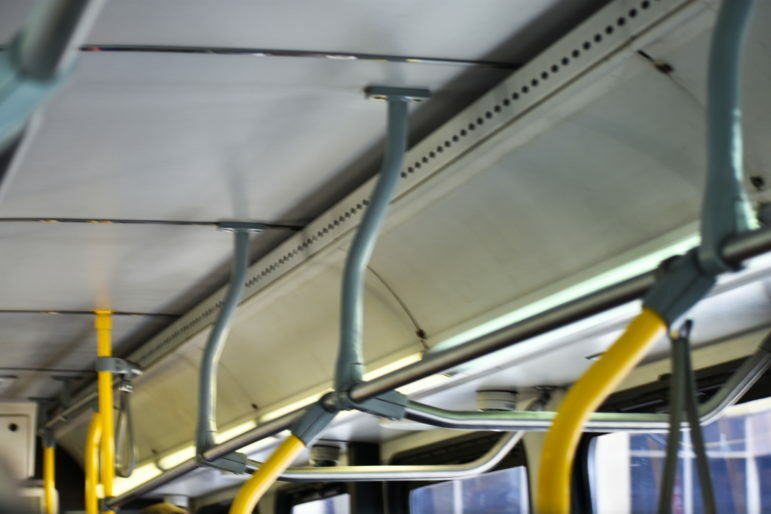 Under the contracts, payments to the HSR are calculated as the greater of the minimum payment or 60% of net revenue for advertising on the inside and outside of buses. HSR managers have refused to reveal how net revenue is calculated is. During the 2004 – 2009 contract, StreetSeen only exceeded the minimum payment three times for a total of $93,725 during that period. Five years later, with the StreetMedia contract extension expiring two weeks later on March 31, 2014, HSR Director Don Hull went in front of Councillors. At the March 17 Public Works Committee meeting, Hull informed Councillors they needed to extend the 2004 contract by another 19 months in addition to the initial five year extension to give him and his managers time to prepare and conduct a bidding process. If Council did not grant the extension, the HSR would loss revenue from having no advertising agent during a competitive bidding process. As HSR managers were looking at extending under a “unsolicited offer” from StreetSeen Media, two of Canada’s most successful advertising agencies were expressing interest in bidding in a competitive process. Hull said the “unsolicited offer” was preferred as it provided a guaranteed minimum amount. “For the 2013 contract year, HSR received a minimum annual guaranteed payment of $425,000”, HSR managers wrote in their report. Despite Pattison advertising’s extensive experience, including being the exclusive agent of the TTC and recently Burlington Transit, Hull expressed concerns that a competitive bid process would result in bids that would not provide a minimum payment. The new offer promised the HSR a 3.5% annual increase to the minimum payment. “Predictable advertising revenues help ensure that the Transportation Division can effectively manage annual budget challenges”, HSR managers stated in the 2009 report. Hull stated there were other advantages to the extension. It would provide an opportunity to merge the bus shelter advertising contract with the on-bus contract at the end of 2015, and will take advantage of the significant advertising opportunity of the 2015 PanAm Games. Hull stated advertising agencies would need a year in advance to book ad contracts for the games. “21-months is not short term, let’s face it”, Ward 8 Councillor Terry Whitehead told Hull. He asked if Council still had the option to immediately go to RFP to see what the competitors would offer. “The revenue generated is less than what was anticipated over this period of time”, Whitehead asked HSR Director Hull citing the City was only receiving the minimum payment. “Actually, with respect to the bus advertising, we’re very comfortable with the revenue generated”, Hull said. “Historically we’ve had a very good track record with them in terms of performance”. Councillor Whitehead was the only member of Public Works Committee who opposed the extension. In October 2015, HSR managers came to Council asking for an extension of the bus shelter advertising contract with Outfront Media for an additional 12 months to have time to prepare a “high quality Request for Proposals (RFP) process”. In September 2016, the HSR came back to Council asking for another year to complete the work. Both extensions were granted. HSR management never returned to Council for an extension of the 21-month StreetSeen extension. The Public Record asked about this in March 2016. There are two HSR related advertising contracts. One is for bus shelter advertising and the contract goes to Out Front Media. The bus advertising contract goes to Streetseen. Both contracts were expiring and needed to be addressed. In October 2015 staff extended Out Front’s contract until December 31, 2016. For Streetseen they opted to go to a month-to-month contract extension. The existing contract is still valid. 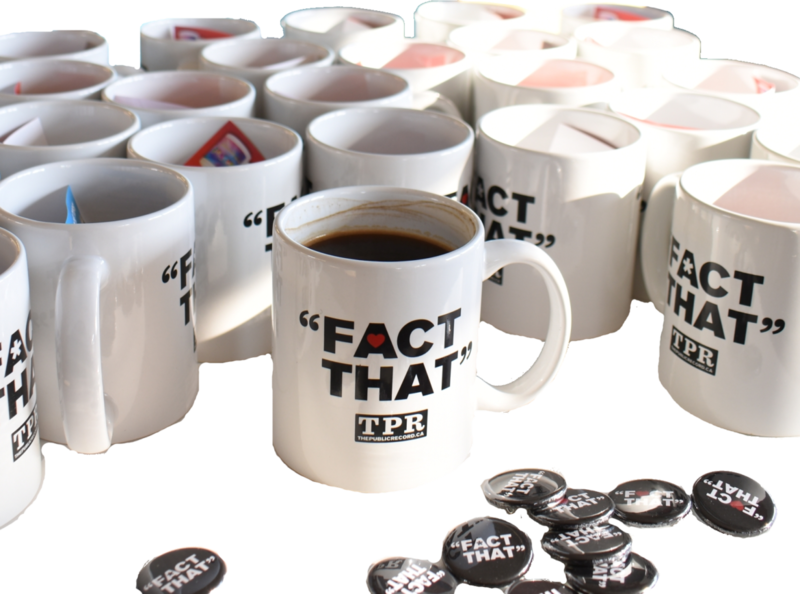 Staff are looking at creating a contract that would combine all related advertising into one big contract so that’s why they’ve maintained month-to-month for now until they determine next steps. In early 2016, StreetSeen added video advertising displays on some HSR vehicles. As seen in the StreetSeen promotional video below (and yes, this is the official video), some of the video displays are installed in such a way that passengers heads are likely to strike the hard screen surface in the event of a collision. I asked HSR Director David Dixon about this design placement and safety risk in March 2016. All Dixon would say, and I really tried to get information from him, is that the project was outside of his control. Asked who installed them, Dixon directed me to the City Manager’s Office, which in turn directed me back to Dixon. Dixon responded The Public Record‘s questions about liability in the event of head injuries from contact with the video boards in a collision. He stated the liability is held by the City. Dixon noted there are not provincial safety standards for the internal layout of public transit vehicles. When asked if he approved the placement of the screens, Dixon directed me back to City communications staff. The video advertising displays were not expanded beyond the initial deployment, but remain in place on buses that were part of the first round of installation. The Public Record reached out to the City’s Manager of Revenue Generation John Hertel. In the 2014 video above, then-HSR Director Hull repeatedly pointed to Hertel – who was not present at the meeting – as the person who would be responsible for the file. Hertel says the bus advertising contract file was never transferred to his office, and his office “have always offered to provide support if requested” by the HSR. I believe the process has been flawed but mitigated by the fact we had a change in management at both the Public Works department as well as HSR. Ultimately the taxpayer is best served with a open transparent process unless it is otherwise justified with evidence based variables. I look forward to a thorough report outlining the rationale of the delay and the status of this initiative.